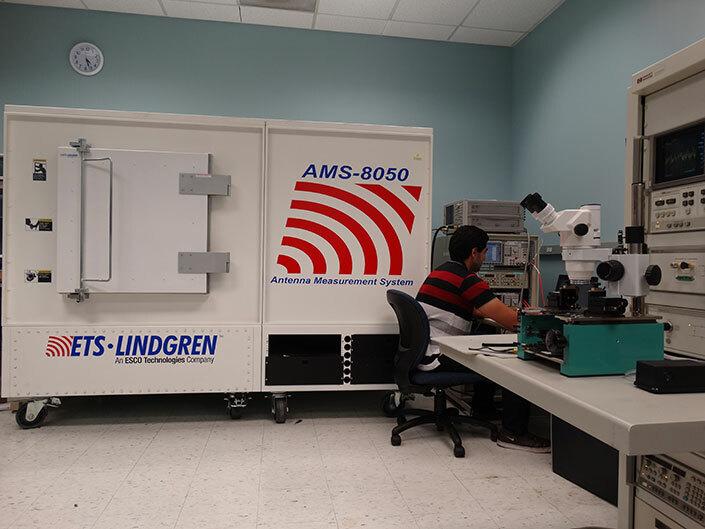 INSYST Lab houses a MultiView 2000TS Atomic Force Microscopy (AFM) inbuilt with RAMAN spectroscopy and Near-field scanning optical microscopy (NSOM) (MultiView 2000TS) and it’s supporting accessories from NANOIONICS IMAGING LTD., USA. The model MultiView 2000TS AFM-RAMAN system is basically used for imaging by probe microscopy of a vast range of nanoscale materials (e.g. Carbon nanotube, Graphene, Boron Nitride, Silicon Nitride, Gallium Nitride transistors, ZnO & TiO2 Nanowires, Silicon and Silicon Nanowires etc.) along with RAMAN mapping which reveal the chemical features, bonding, phonon vibration of nanomaterials. Recently, in scientific field, research trend incorporated with developing of new materials associated with its real life applications as a form of different devices. Scanning Probe microscopy (AFM, STM, MFM) is one of the techniques which can goes down to atomic scale resolutions with precise imaging. Similarly, Raman spectroscopy and Near-field scanning optical microscopy is nondestructive characterization techniques which provide information regarding inter-atomic bondings characteristics and chemical structures & local stresses respectively. Therefore, this integrated system is highly useful for characterizing some special nanostructures like graphene nanoribbon, serpentine carbon nanotubes including inorganic as well as polymeric nanowires and nano-composites etc. In some special cases, like surface functionalized nanoparticles, it is highly difficult to characterize their topography as well as inherent bonding between nanomaterials and functional groups. In this context, researchers have to carry out all those characterizations in several distinguished systems with different resolutions which are basically unprolific and sometimes formulate fallacious conclusions. Furthermore, this integrated system is added advantage for investigating the characteristics of some complex systems like, bio-molecule functionalized nanotubes, metal/polymeric-quantum dots heterostructures and nano-channel conjugated with different DNA for biosensing applications.This instrument is a low cost for the academic institutions and research laboratories involved in nanoscience and nanotechnology research and can be used for wide range of functional and pristine materials characterizations at nano-scopic level. In sum, this specialized characterization system is much faster and dramatically easier in order to obtain conspicuous accurate results instead of other cumbersome technique. The complete working system of MultiView 2000TS system includes all scanning probe microscopy (e.g AFM, STM, MFM, LFM etc)) along with Raman spectroscopy, tip enhanced raman spectroscopy and near-field scanning optical microscopy(As shown in Figure 1, left). 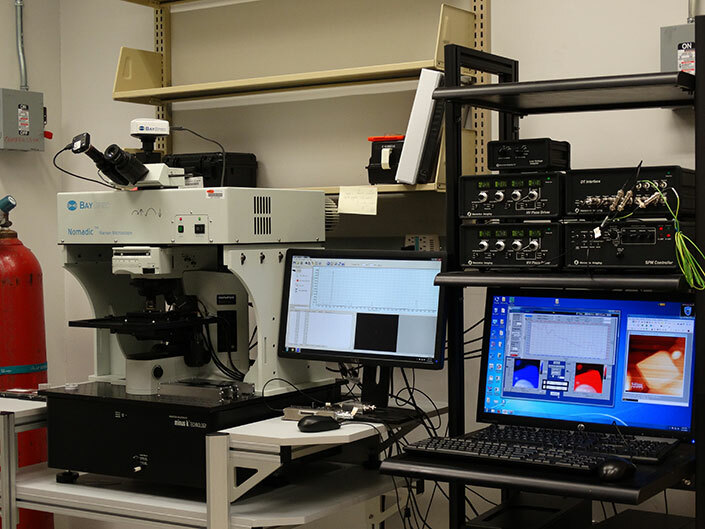 This system includes complete Atomic Force microscope with aperture/aperture-less cantilever-based NSOM experiments, consisting of fully XY & Z scanners using flexure guided scan system for all three axes, SLD XE-NSOM head, top illumination module, high resolution digital CCD camera with digital zoom, bottom collection module, motorized Z stage, motorized focus stage, manual precision XY sample stage, control electronics, computer, software and accessories. Further, the system is inbuilt with 400-700 nm laser assembly, optical grating system and a high resolution digital CCD camera for precise signal detection. 1. 400 to 700 nm Laser which provide the flexibility of wide range of materials characterizations. 2. Excitation laser input is a single-mode fiber with collimator that includes an XYZ-align mechanism for the optimal illumination and a linear polarizer (Extinction ratio: 100,000:1). 4. Top and bottom illumination mode for Raman spectroscopy, tip enhanced Raman spectroscopy and near field scanning optical microscopy. 7. 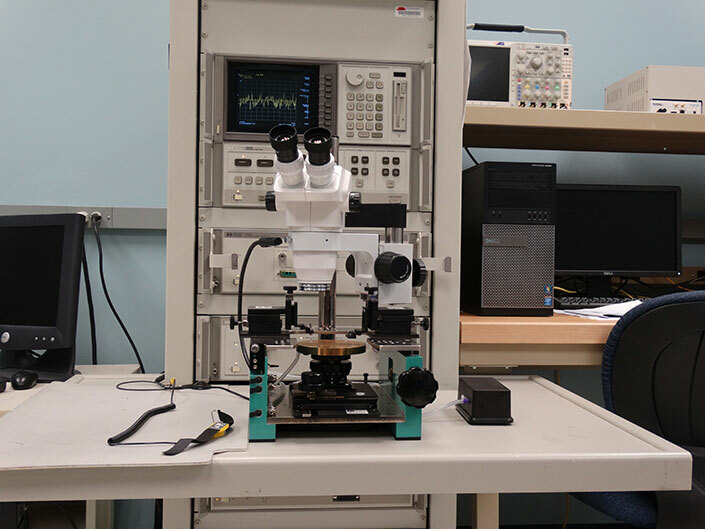 AFM supports standard for AFM/SPM modes including true non-contact mode, dynamic contact mode, contact mode, LFM (lateral force microscopy), F/D spectroscopy and performs STM, MFM, EFM, Enhanced EFM, DC-EFM(PFM), SKPM, SCM, SSRM, SThM, FMM, Conductive AFM, VECA, ULCA, Nanoindentation with upgraded version of the system software. 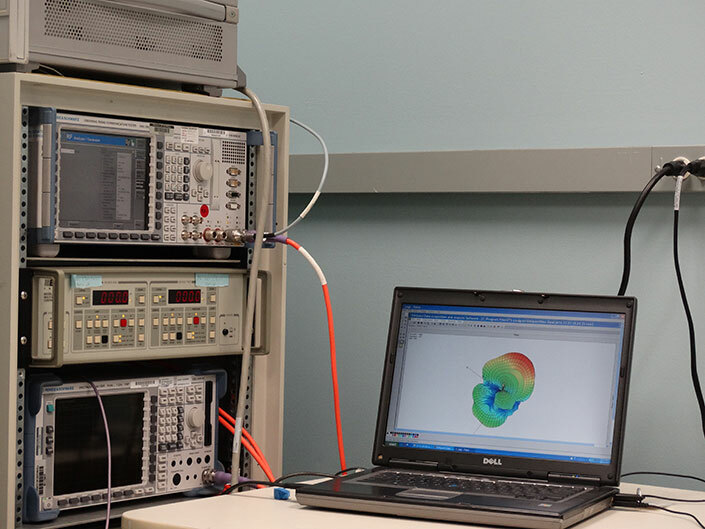 Our time domain spectrometer (TDS) covers the spectrum from 0.1 THz up to 3 THz which gives us the capability of characterizing our devices in a broad THz spectrum. The optical set up is prepared to make transmission measurements. The system is also capable of making measurements at cryogenic temperatures. The modification in the optical set up will also let us to measure reflection from the devices if necessary. A GaAs emitter antenna is excited with 20mW 100 fs pulsed laser at 780 nm wavelength. The emitted THz and probe laser is mixed inside the ZnTe crystal and polarization rotation is measured as a function of time (delay line). The terahertz pulses are generated by an 100fs ultrashort pulsed laser and last only a few picoseconds. A single pulse can contain frequency components covering the whole terahertz range from 0.05 to 3 THz. 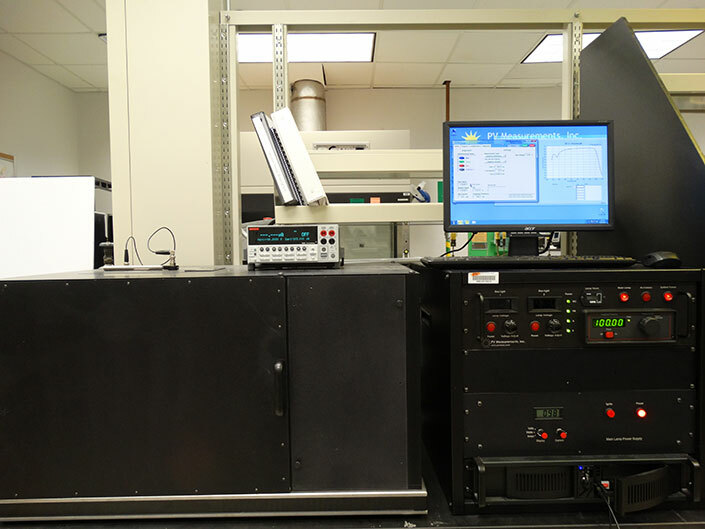 For detection, the electrical field of the terahertz pulse is sampled and digitized. In THz-TDS, the electrical field of the THz pulse interacts in the detector with a much-shorter laser pulse (0.1 picoseconds 20mW) in a way that produces an electrical signal that is proportional to the electric field of the THz pulse at the time the laser pulse gates the detector on. By repeating this procedure and varying the timing of the gating laser pulse, it is possible to scan the THz pulse and construct its electric field as a function of time. Subsequently, a Fourier transform is used to extract the frequency spectrum from the time-domain data. INSYST has also backward wave oscillator (BWO) based THz spectroscopy system based on QS1-370-T Quasi-Optical Source from Microtech Instruments Inc. The QS1-370-T is a quasi-optical source, tunable across 210-370 GHz and 630-1100 GHz frequency ranges. The unit is rapidly configurable for any of those ranges. This makes it an excellent choice for a broad range of research and industrial applications. The QS1-370-T quasi-optical source is a hybrid device composed of a QS1-370 (OV-30) backward wave oscillator (BWO), waveguide adapter and a Schottky diode frequency tripler. The spectrometer is flexible to measure transmission and reflection spectra in 0.2THz – 1.1 THz. The entire setup is computer controlled and through phase shift measurements can extract the real and imagery parts of the dielectric constant. In the baseline configuration, QS1-370 produces up to 10 mW continuous wave tunable monochromatic power with a bandwidth of 3 MHz. The Schottky diodes attach easily to the wave guide adapter for quick range changes. With the frequency tripler the power spectrum has a broad usable range 630-1100 GHz with power up to 0.3 mW. The frequency doubled configuration has a bandwidth of 10 MHz. For further information please see the data sheet. The HP 8510C vector network analyzer makes broadband measurements from 45 MHz to 50 GHz in 2.4 mm coax, from 45 MHz to 110 GHz in 1.0 mm coax and from 33 GHz to 110 GHz in waveguide bands with unmatched accuracy and convenience. The HP 8510C network analyzer measures the magnitude, phase, and group delay of two-port networks to characterize their linear behavior. Optionally, the HP 8510C network analyzer is also capable of displaying a network’s time domain response to an impulse or a step waveform by computing the inverse Fourier transform of the frequency domain response. Eight instrument states can be stored in nonvolatile memory via the SAVE menu. They can then be recalled via the RECALL menu. Eight traces of data can be stored in the trace memories. Traces 1-4 are stored in nonvolatile memory. The built-in disk drive of the 8510C can be used to store and retrieve different types of data on a 3.5 inch disk. Data files can be stored in either the HP LIF or MS-DOS® formats. Diskettes of double sided format or high density format are recommended. Data can also be stored on disk using an external disk drive with command subset SS/80. Data files are stored in Hewlett-Packard’s standard LIF or MS-DOS format. The HP 8510C network analyzer can be Combined with an HP 8514B, 8515A, or 8517B for making full S-parameter measurements. A wide range of accessories support the HP 8510C network analyzer including calibration kits, verification kits, cables and adapters in 7 mm, 3.5 mm, 2.92 mm. Type-N, 2.4 mm, 1.85 mm and 1.0 mm coax and in the standard waveguide bands. The time domain option (010) converts data from transmission or reflection measurements to the time domain using the inverse Fourier transform and presented on the CRT display. In this imaging spectrometer, a spectrograph and a monochromator are combined in a single unit. Spectral module of the iHR320 can operate in either raster spectrograph mode or in the mode of scanning monochromator. To optimize the ratio between the width of the operating swath and spectral resolution, the drive module of the module can be adjust to three different diffraction gratings. 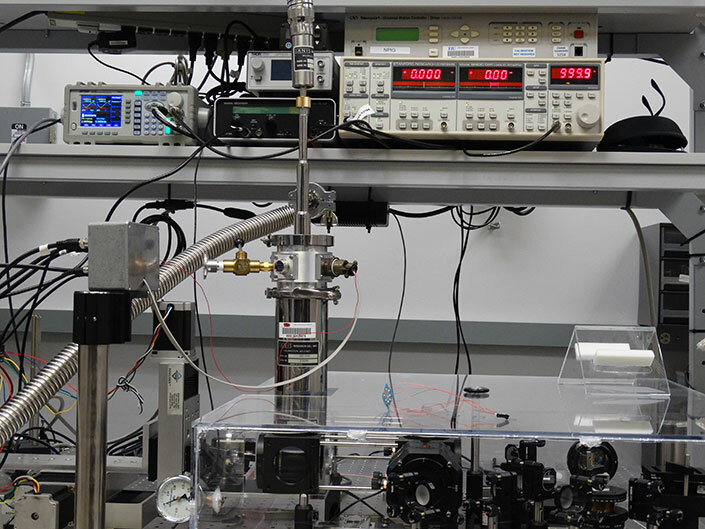 To achieve the highest throughput from our spectroscopic experiments, we will use HORIBA Scientific iHR320 imaging spectrometer setup with a solid state detector (for VIS-NIR measurements). 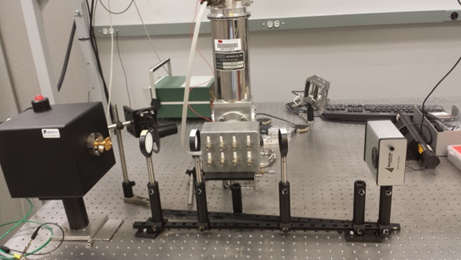 Coupling between this detector and iHR320 imaging spectrometer will dramatically improve our measurement results. The iHR320 has several capabilities to work properly with a CCD detector such as a toroidal mirror (to correct astigmatism and resolution) and sagittal focal planes to cross at the center of the focal plane. This provides the flexibility to choose between imaging and resolution optimization by selecting the desired detection angle. Also, iHR320 has one of the largest flat fields for an imaging spectrograph. The imaging quality over the entire flat field has been maximized by using an asymmetric layout. A larger focus mirror which is inside the setup allows the entire flat field to be used without vignetting. Some of the uses cases of this spectrometer are Raman spectroscopy, photoluminescence, plasma/emission analysis, fluorescence and absorption/transmission/reflectance spectroscopy. In Fig. 3, a schematic representation for an absorption/transmission/reflectance spectroscopy with using iHR320 setup is indicated. With this way, we can determine the optical properties of materials. The automated triple grating turret coupled with our motorized order sorting filter wheel, dual exit ports of the iHR320, and a wide variety of light sources and detectors give the flexibility needed to cover all wavelength ranges from 180 nm to 20 microns. The system includes PTI PowerArc (OB-75X) integrated high intensity 75W xenon source – the ideal point source with integrated power supply and ignitor, sealed lamp housing, f/4.5 ellipsoidal reflector, quartz window and 75W xenon lamp. HP 8510C vector network analyzer with RF probe station. Dr. Pala also has access to Bruker IFS 66 v/S FTIR spectrometer coupled with bolometer for THz detection. Phillips CM-200 200 kV Transmission Electron Microscope (TEM) with Oxford Energy Dissipation Spectrum (EDS). JEOL 35CF Scanning Electron Microscope (SEM) with EDS. JEOL 100C Transmission Electron Microscope (TEM). Siemens 500D X-ray Diffractometer (XRD) with residual stress measurement and high temperature capabilities. Siemens 5000D X-ray Diffractometer with high pressure cell. TA Instruments DSC 2910 Differential Scanning Calorimeter. TA Instruments DMA983 Dynamic Mechanical Analyzer. TA Instruments TGA 2950 Thermogravimetric Analyzer. Thermolyne 1700oC High -Temperature Furnace. Lindberg 1200oC High -Temperature Tube Furnace. Vacuum Arc-Melting Furnace (from Oak Ridge National Lab). JSM-8900R, a five WDS (Wavelength Dispersive Spectrometer) EPMA (Electron Probe for Micro Analysis) with UTW (Ultra Thin Window) EDS (Energy Dispersive Detector) and the Oxford PANACLD (cathodoluminescent Detector). The system is capable of quantifying elements from Boron to Uranium to .01 weight percent using WDS analysis and analyzing 13 elements simultaneously using both EDS and WDS spectrometers. The system is fully automated and equipped with the latest software for phase analysis, ZAF and x-ray mapping. The system will be additionally capable of remote access via the Internet. JSM-5900LV, a SEM (Scanning Electron Microscope) with EDAX UTW-EDS, CLD, BSE and SEI detectors available. The system is fully automated and is capable of imaging uncoated samples using the low vacuum method. The 5900 has a resolution of 3nm and a mag rang from 18X to 300,000X and is capable of either Polaroid or digital imaging. Pelco Carbon evaporator for basic carbon coating in EPMA quantitative analysis. SPI Gold evaporator to sputter coat gold or some gold composition onto the sample surface for high resolution EM work. Last two items are located in a specialized sample preparation laboratory outfitted with all the equipment needed to prepare samples for EPMA or SEM analysis. Special sample handling and storage units are located on site to maintain sample integrity and identity. The rooms, which house both instruments have been analyzed to be sure that the electromagnetic fields and vibration are at a level acceptable to the instrumentation vender requirements. Low-pressure diamond-anvil cells for studies at a few bars to several kilobars. Mao-Bell Type diamond-anvil cells for ultra-high pressure studies. 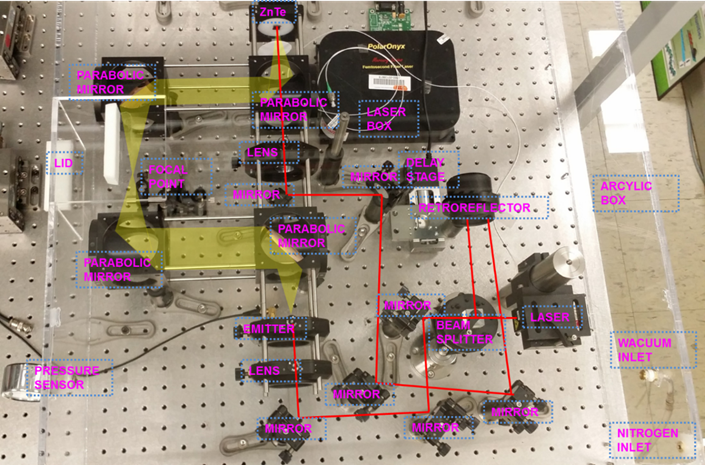 An Ar-laser with a power of 5 W for Raman spectroscopy. The Ar-laser also powers also a Ti-sapphire laser for tunable wavelengths to 950 nm. Both lasers are used for Raman fluoresces studies. Micro-Raman Spectroscope comprised of a Holographic Band Pass Spectrometer from Kaiser with a 2D silicon based CCD detector from Andor. High-precision two-circle goniometer with independent stepper motors for q-2q movements. MoKa radiation (tube voltage 50 kV, tube current 24 mA, cathode gun 0.1x1 mm). 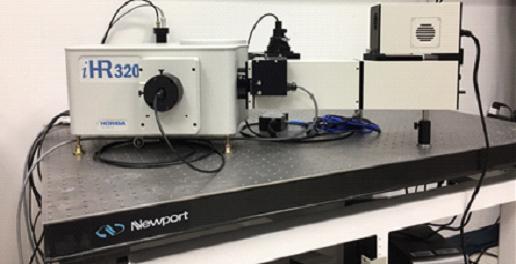 Collimator with a diameter of 30 micron with optically focused beam for high pressure studies to 50 GPa. 62 mm x 62 mm active area; 1:1 demagnification ratio; Number of pixel: 4096 x 4096; CCD pixel size: 15 mm x 15 mm; Chip readout time (high speed): 0.3 sec.